Mick Finch - Studio Notes:Closer Than You Think, Sublimey and Nevermind. The Journal of Visual Art Practice, n°. 8.1/2, 2009 edited by Mick Finch. Closer Than You Think, Sublimey and Nevermind. This essay will discuss how a critical and theoretical background informs and relates to my studio practice. This background is broadly concerned with issues of abstraction and representation in painting. I am concerned by questions about the rhetoric of painterly pictorial structures, painting as a specific medium, the history of its transformations and its polemical positions. An important and recurrent theme will be the relationship between cultural hegemony and painterly abstraction in terms of questions of signification. I would like to point out however, that this theoretical and critical background is not demonstrated by the paintings. It is literally a background to the making of the work where a series of propositions set up a critical dialogue. Much of the logic of the painterly strategies at work in my recent painting can be traced back to the early 1990s so I will give an overview of these sources before entering into an account of more recent work. Between 1994 and 1996 I made a series of paintings entitled Closer Than You Think. This series was set against a particular critical perspective about questions of painting and medium within a more general cultural and historical context characterised by issues of hegemony. The discursive focus for this was the critical polemic between Clement Greenberg’s high modernity and Minimalism, particularly in terms of the work and writings of Robert Morris and Donald Judd. As Michael Fried has pointed out, Minimalism was in many ways the logical conclusion of much of Greenberg’s thinking (1). Morris and Judd found the weaknesses in Greenberg’s ideas about medium and a pictorial condition. With relative ease they were able to undermine what some would see as Greenberg’s conservative idea of painting. In turn they constructed another formal position around a categorical hybrid of the art object which was “not painting, nor sculpture” but specific objects (2). The polemic here was between a reductive dynamic in Greenberg’s thinking around an absolute and specific idea of medium, which was in contrast to the expanded, and relational idea of the art object and its context in Minimalism. This moment in the history of the Modernist avant-garde seemed to me to be crucial when thinking about painting within a contemporary context. Minimalism not only delivered a decisive blow to painting’s previous centrality in the Modernist project but also determined the basis for an artistic practice within an expanded field rather than in terms of a specific medium. In addition to this, Judd made a distinction between the American and European context. The part-by-part functioning of compositional works of art he saw as being an ‘objectionable European relic’ (3). In contrast he saw the best recent American art as being characteristically non-compositional, externalising, relational and dynamic. This contrast between the internalised/compositional and externalised/non-compositional qualities led Morris to develop his ideas around a perceptual relationship to shape. By applying the distinction between composition and non-composition one stage further, Morris arrived at a distinction between complex and unitary forms. A complex form required that the spectator disassemble it and understand it in terms of its parts. The spectator’s understanding of simple or unitary form is, in contrast, immediate being driven by the form’s gestalt and requires no such part-by-part reading. This gestalt effect for Morris is what he understood as being the motor pushing the spectator’s reception of the work within a situation. To compound this quality, Minimalist art tended to be organised, exhibited and installed around grid-layouts prompting an a priori reading of the work by the spectator. The resulting installation can be thought of as a ‘situation’; a totalising work that even includes the spectator. The issues in this debate seems to me to be crucial in terms of a contemporary condition of painting and they unusually came together when I saw a billboard advert for Euro Disney in 1994 at the entrance to the Eurostar terminal in Waterloo Station in London and a parallel poster campaign in the London Underground stations (see illustration 1). The visual motif for the each poster was a fragment of a Disney cartoon character. For the Eurostar poster this was the eye of Mickey Mouse (his ears were used for the Underground posters). The Eurostar poster neatly doubled as an image of a tunnel as well as of Mickey Mouse. What struck me with this image was how efficient the Mickey image was as a graphic gestalt. A mere portion of the image was enough to evoke, instantly, the total identity of the image. 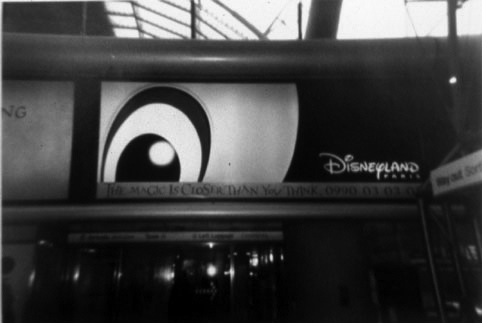 Moreover, the poster’s slogan, ‘The Magic is Closer Than You Think’ reinforced the sense of the automatic working of the image’s gestalt switching between a fragment and a reading of it in terms of its identity. The cunning structure of this publicity image brought into focus for me one of the paradoxes of the Minimalist project. That its relational objectives and its structural use of gestalt forms corresponds in many ways with a cultural and communicational model of visual form that can be seen to be very much at work, all be it insidiously, in the Disney campaign described here. Gestalt forms are the stock in trade for billboard and poster campaigns and the Disney/Euorstar campaign is an excellent example of their application. used camouflage as a border within which a thick painted ground had a Mickey Mouse image repeatedly imprinted into it. Paint was systematically dripped from each side converging in the central ground and revealing the imprinted images as well as creating a drip grid network. The camouflage was a motif called ‘Trellis’ which was used by the US army in the Vietnam war. The syntax of the imagery here was very specific. 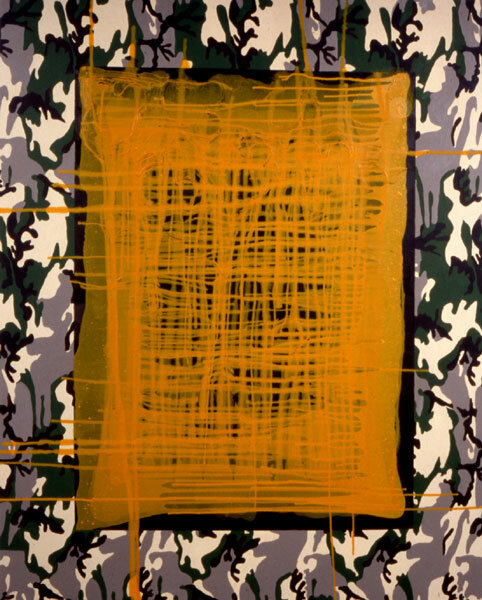 Camouflage painted onto the canvas functions much like Jasper Johns’ targets or flags. As a token image it confounds a straight forward reading; it functions equally as camouflage as well as a reference to or a representation of camouflage. Similarly the imprints of Mickey Mouse’s head (from a Mickey Mouse shaped box) were an indexical deployment of the image. The intention here was to situate the spectator within the material address of the painting, where dripping, and a range of mark making drew in and compelled the viewer to make a reading of the work. At the same time a layer of associations generates a field of references and signification. With a work like Trellis (mm2), a syntax of painterly abstraction was brought to bear upon forms strongly associated with American culture and questions of hegemony. Such references were made consciously and related in many ways to some of the issues of US cultural hegemony raised by Serge Guilbaut (5) and Yve-Alain Bois (6) which I will expand upon in the next section. What was as interesting for me with Trellis (mm2) and other paintings from this series was how a structuring of visible and invisible qualities can be read across a cultural axis and not just as a phenomenological reading of the invisible/visible in terms of presence/absence, which is so often the case with painterly abstraction. This brings to mind for me one of the key critiques of humanist culture, Louis Althusser’s ‘Ideology and Ideological State Apparatuses’. (7) When the ideological emphasis of institutions are rendered invisible and are naturalised into an ’obviousness’. 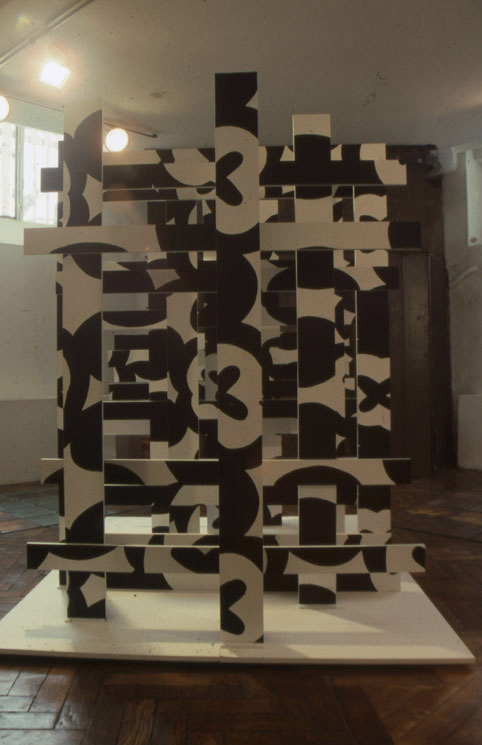 The tension between the invisible and the visible in Trellis (mm2) produced an insidious reading; something hidden and material at work within the representation transforming merely incipient elements into something apparently subject to ideological effects. The objective throughout the Closer Than You Think series was to situate the spectator within a painterly strategy whereby vigilance and interrogation of the painterly scene is essential. (9). The emphasis was upon painterly syntax and rhetoric combined with culturally specific material that is embedded into the structure of the tableaux. There have been some key theoretical strata that have developed out of Closer Than You Think into my present work. Before discussing my next stage I’d like to map out these preoccupations. I believe this term was first coined by Art and Language. It refers to Michael Fried’s notorious essay ‘Art and Objecthood’ (10). This essay is complex and has fuelled a series of debates since it was published in 1967. Indeed I think there is much in this essay that can be disputed, especially in terms of how Fried fought the corner of High Modernist painting and sculpture. However the key critique here of Minimalism as being theatrical and that somehow painting has the potential to be anti-theatrical is a crucial line of thought for me and will be easily discerned from my account of the Closer Than You Think series in its polemical relationship to Minimalism. Thickness here really does open up the possibilities for thinking through painting - the notion of work in relation to the surface adds up to an idea of excavation of the tableau as well as of the painting. Damisch's reference to the ‘geologist’ that Dubuffet was to become, is an early echo of the sense of what the surface of painting, epistemologically and as the objet de connaissance, was to become for many French artists and particularly those associated with Supports/Surfaces. Damisch's description of the working of this surface as a material entity in itself, throws into question the flatness of painting as being in itself a specific limit of the medium as well as an a priori condition. Greenberg's centring of specificity around flatness and the subsequent hyper-realization of the optical illusionism that he claimed was inherent to painting, shut down the possibilities of materially working painting in terms of surface as a 'thickness'. Supports/Surfaces in a restricted sense was a demonstration of just such possibilities where the material manipulation of the surface was seen as a site of inscription in painting that undermined ideas of ground and field that were at work in the USA. Damisch's use of thickness throughout a number of texts from the early sixties on is accompanied by an oscillation of its relationship with painting and the wider term tableau. The use of tableau in lieu of painting is highly significant, as well as complex, in relationship to French critical thinking. After Closer Than You Think my work went through a phase where the ideas discussed in the last section were the general background for a strategy to make three related series of works. Ply-ground, 1998 – 2000 (see illustration 3), Mono-ply, 2000 – 2002 (see illustration 4) and Multi-ply, 2000 – present (see illustration 5) used a technical development that occurred during Closer Than You Think where I started to use masking tape. I found that a small vestige of paint leaked under the masking tape and that this could be active as a way of ‘re-grounding’ sections of a painting. In the Ply-ground paintings the Mickey Mouse, camouflage and paint drip systems were inscribed into different linear networks weaving over and under each other. The first of these paintings had a black ground and the line networks were masked up with a first coat of white paint followed by black and then over-layed with a motif. When the tape was removed there would be the vestige of white paint around the entire line network. In Mono-ply this same process was applied but without the motifs. The sense here of each network being re-grounded into the painting was fore-grounded here. The Mono-ply paintings were monochromes in all except the white halo around each line network signalling the paintings primed undercoat. In Multi-ply the paintings were made in series of six, each of the six paintings having a different coloured ground. 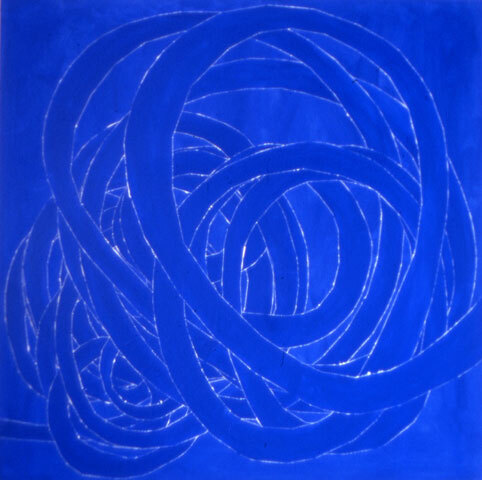 In each painting there were five line networks, woven into each other. Each network used a first coat of a colour from the other paintings in the series, with the second colour the same as the painting’s ground. The sense throughout these works has been to use the painting’s materiality and construction to displace the spectator into a series of readings. The principle here is that of a kind of parallax effect most pronounced in the Ply-ground series where each ground network would have a different motif inscribed within it. In Multi-ply the colour coding of each ground acted as a displacement between the different paintings. These works were also made upon the flatness/thickness critical axis and with Mono-ply and Multi-ply the reductive aspect of painting as monochrome was brought into question. this constructive logic was applied as a three-dimensional form redeploying the Mickey Mouse, camouflage and grid visual vocabulary of Closer Than You Think. These four distinct series of works lead directly to the work made since 2002 and generically known as the Sublimey paintings. 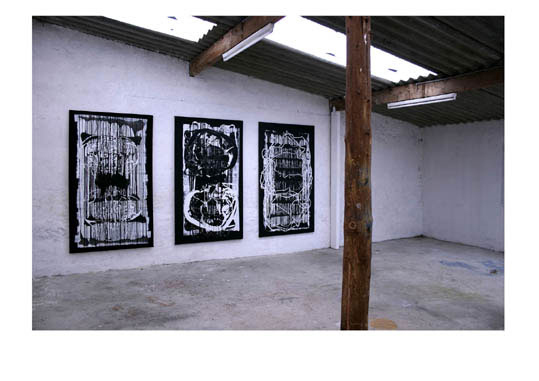 I began the black and white Sublimey series of paintings in 2002 as a way of integrating several aspects of the Closer Than You Think series and the Ply – paintings. But I also sought to position it so that particular aesthetic structures are material to the work’s reception. Like Closer Than You Think, Sublimey uses modes of representation where processes of painterly abstraction offer culturally hegemonic forces for examination. In Closer Than You Think, this was structured in relation to American culture, Pop, Minimalism and a generally post war context. In Sublimey the references and context is more European, and most particularly British. A formal structuring of shapes and images within the re-grounding process that was first forwarded in the Ply-ground paintings is central to the construction of these works. This diversification of figure/ground motifs within one ’scene’ and within the form of the painting as a tableaux links to the aim of structuring the painting around parallax effects; a set of shifting rhetorical and formal addresses that inhibit a totalised, gestalt reading of the work. The European context here is consolidated around an 18th century aesthetic debate between the two extremes of the sublime and the beautiful. Uvedale Price’s development of the picturesque as the midway point between these two poles and even as a corrective to their excesses has been an important touchstone for the Sublimey series (16.). A number of processes and strategies have come out of this. Firstly, as before, there is the process of inscription, the ‘re-grounding’, through the use of masking tape, of a distinct element in the pictorial regime. This has the effect of looking like the shape or image has been collaged into the painting. This effect of faux collage is a way of articulating the scene as a set of distinct and discrete disjunctions rather than as a seamless and synthesised space. In addition painterly operations animate the space between the virtual painting surface and its function as a support for image and shape inscriptions. As in Closer Than You Think this layers images into the surface of the painting; playing between a discreet entity being readable and evident or being subject to its environment or even seeming to be formless material. The painterly aspect also reinforces the painting’s status as a surface. It is flat and when the surface is tilted so that the paint drips across the vertical or horizontal axis it expresses its potential within an expanded field of painting. The play between painterly strategies and shape and image inscription establishes a kind of painterly web or grid in which painterly events coincide, creating a layered scene that operates within an order of visibility, invisibility and effacement. The process of image selection and transcription has also become vital to the work. For the, most part, images are found on the internet as low resolution files. After processing in Photoshop, and schematising as black graphic images or silhouettes they are printed out and projected onto the canvas using an overhead projector. This process is both near and far. I move from the aporia of the internet, the schematic regime of the transcription to the physical proximity of the canvas in the darkened studio. The near and far here are like an inversion of a perspectival near, middle and far distance. In addition this procurement of an image has something of the readymade / found object about it. The re-transcription involved here is a re-contextualisation of the image as an object. It raises the kinds of questions and qualitative issues often associated with collage. The sampling and grabbing of images for Sublimey has become a process in itself. The different categories of images have brought into play distinct pictorial mechanisms that have been a result of the rhetorical qualities of the images. Sublimey 3, 23 & 26 (see illustration 7)uses head forms, in this case the silhouette of a monarch, Elizabeth II and two skull images. As images of heads they both have iconic qualities, in the case of the monarch the insidious panoptic gaze and with the skull, references to mortality and vanitas. In each case the shift from the image’s literal reference to a head and an iconic significance are crucial in the material incorporation of the images into the pictorial regime. The movement from the literal to the iconic are echoed in the images being embedded in the tableaux; the anthropomorphic scale and vertical orientation of the canvas and the sense of the image passing within and across the signatory field. In other works the lexical aspect has determined the relationship between images and the painting’s construction. Extinction and passing have been recurrent themes for such images; dinosaurs and skeletons as well as obsolete machines and objects. Some images, such as the Fender Stratocaster guitar and the AK47 machine gun, evoke iconic associations and have further, allegoric potential and have been the focus of my current series of colour paintings that I have provisionally entitled Nevermind. My intention from Closer Than You Think to Sublimey and now to Nevermind (see illustration 8), has been to position the spectator within an active relationship to the paintings. By locating the image within a visual and pictorial rhetorical regime, the tableau offers up its apparatus to the spectator in order to give them a sense of the work working. To sum up, I see the background I have laid out here as a sort of ethic of making and representation. This regime does not mitigate the demands of the daily practice of painting; the trial and error, the accidents and intuition. not to mention the success or failure of a work. © text & images, Mick Finch, 2005. Donald Judd, Specific Objects, in Judd, Complete Writings, Halifax Nova Scotia,1975. Robert Morris, Notes on Sculpture 1-3, dans Art in Theory 1900-1990, Blackwell Oxford UK & Cambridge USA. Serge Guibaut, How New York Stole the Idea of Modern Art: Abstract Expressionism, Freedom and the Cold War, Chicago, 1985. Yve-Alain Bois, Painting as Model, Cambridge USA, 1990, in Introduction: Resisting Blackmail, pp xi – xxix. Louis Althusser, Idéologie et Appareils Idéologiques d’Etat, publiée dans La Pensée, Paris,1976, pp 3-38. English version in Art in Theory 1900-1990, Blackwell Oxford UK & Cambridge USA pp 928-936. I have discussed this and related issues in some of my published writings, particularly: Painting As Vigilance, Contemporary Visual Art Magazine (15), London ; New Technology, New Painting?, Contemporary Visual Art Magazine (17), London and Article, Night Shift, in a specila edition on painting of Contemporary Magazine (58), ' The Situation of Painting'. Michael Fried, Art and Objecthood, University of Chicago Press, Chicago and London, 1998. pp 148 – 172. Michael Fried. 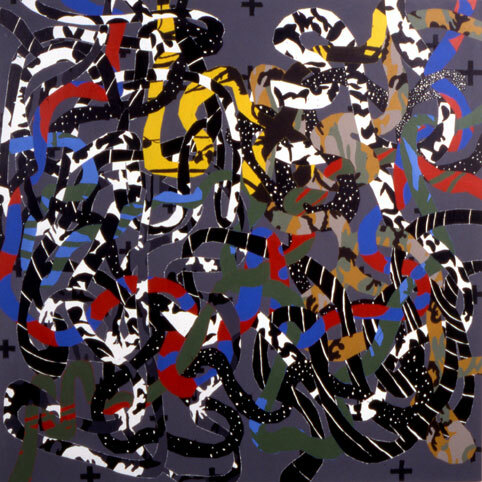 Absorption and Theatricality: Painter and Beholder in the Age of Diderot, Chicago,1980. Ibid. Quotation by René-Louis de Giradin, De la composition des paysage (1777), Editions du Champ Urbain, 1979, p19.